Werribee, about 27 km south-west of central Melbourne, is midway on the Princes Highway to Geelong. It is situated on the Werribee River, which has its headwaters north of Ballan. Pastoral leaseholders included members of John Batman's Port Phillip Association. Rural amalgamation began in the early 1850s, shortly after a village reserve was surveyed. The village was named Wyndham, apparently at the suggestion of the owner of the new village inn, Elliott Armstrong, who knew Sir Henry Wyndham, a soldier who had distinguished himself at Waterloo. 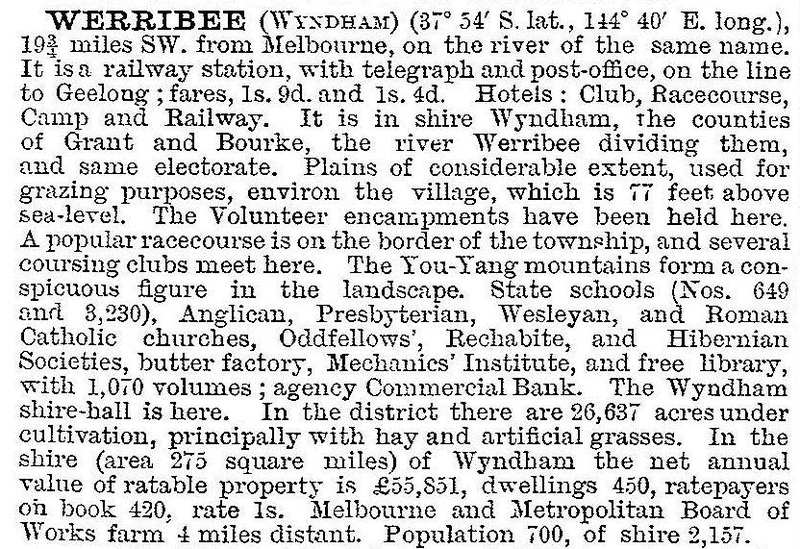 The name Werribee had already been given to the river, however, and overtook Wyndham as the town name (1884) and the shire name (1909). Werribee is thought to be derived from an Aboriginal word for spine or backbone, which describes the strong visual curve of the river over the nearly treeless plain. Rural amalgamation around Werribee was massive. Thomas Chirnside was attracted to the open plain's suitability for grazing and its proximity to the Melbourne markets. By 1863 he controlled more than 28,300 ha in the Werribee district. W.J.T. (‘Big’) Clarke of Sunbury also had a substantial holding in the district. Pastoral dominance reduced the number of smaller holdings as they were bought up by Chirnside in the 1860s. The town grew relatively slowly, but steadily. A railway line was opened between Newport and Geelong in 1857, with a station at Werribee. A Church of England school, opened in 1855, was replaced by a National school in 1861, the year in which a Catholic church was opened. On 10 October 1862, the Wyndham Road District was proclaimed, and was replaced by a shire council on 11 March 1864. The shire extended from Footscray to the Little River, and northwards to the Melton Reservoir. The area was 276 sq miles, or 715 sq km. It included Balliang, Laverton, Little River, Mount Cottrell and Point Cook. 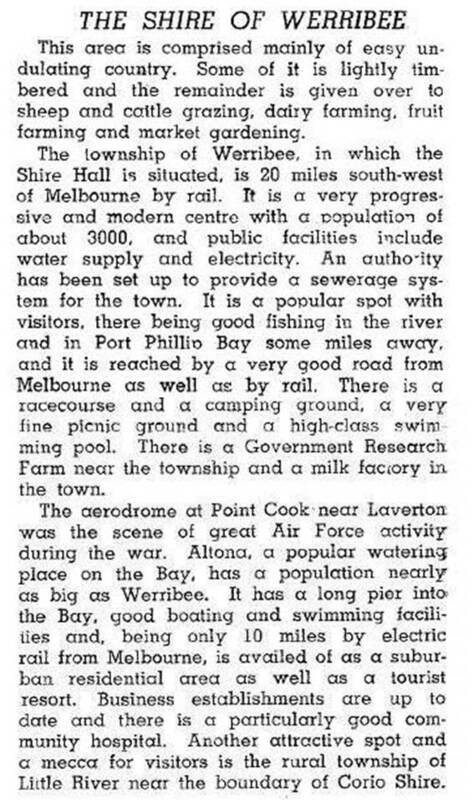 The shire also included Altona until it was severed on 29 May 1957, to form a separate shire. The name change to Werribee shire occurred on 15 December 1909, and proclamation as a city took place on 20 March 1987. On 15 December 1994 when Victorian council boundaries were restructured, the name was changed back to Wyndham, and a small part in the north was transferred to Melton shire. Between 1860 and 1890 Werribee had two centres of gravity, the township and the Chirnsides' Werribee Park. Thomas' brother, Andrew, joined him in 1875 in acquiring land around Werribee, ultimately enlarging the holding to over 37,600 ha. By 1878 the brothers had completed the building of the Werribee Park mansion, about 3 km south of the Werribee township and 500 metres east of the Werribee River. The dry, rain-shadow property was augmented by wind-pump wells, and it became the site of coursing, hunt-clubs, elaborate annual picnics and a volunteer troops encampment for colonial defence. The Chirnside Battery's drill ground was south-west of the mansion on a flat beside the river. In 1884 Thomas Chirnside donated land for St Thomas' Presbyterian church. The suicide of Thomas, the Laird of Werribee Park, in 1887 and his brother's death three years later resulted in the property being divided between Andrew's two sons. A second mansion ‘The Manor’ was built by the son who inherited the property north of the township. Shortly after the Werribee Park estate came into the sons' hands, land taxes persuaded them to bring in tenant farmers. The cleared grazing land was readily converted to cropping and dairying. During the early 1900s some tenant farmers became freeholders, and all told about 130 farmers were living on land that had recently been a family sheep walk. In 1892 the Melbourne and Metropolitan Board of Works acquired 3580 ha from the Chirnside estate for the metropolitan sewage farm, the site later being named Metropolitan Farm. The Werribee township formed a progress association in 1910, to quicken the pace of change and improvement of amenities. Reticulated water was supplied by the State Rivers and Water Supply Commission until 1929, when the Yan Yean supply was finally connected. In 1904 the State Government acquired land for closer-settlement farms, and the Commission's irrigation improvements brought about successful settlement eight years later. It ushered in a community of Italian market gardeners, as well as orchardists and poulterers. The State Research Farm (later the Animal Research Institute) was begun in 1912. 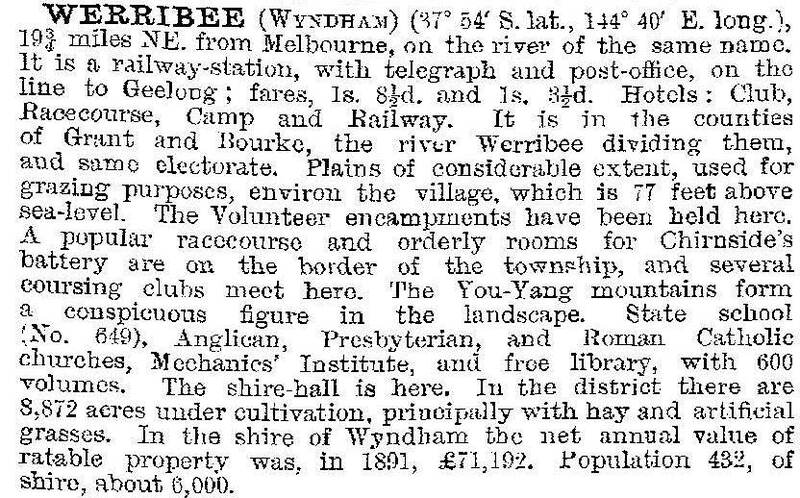 Soldier settlers took up farms after World War I, and in 1925 the area was renamed Werribee South (see separate entry). The township had four hotels, four churches, two savings banks and branches of two others, market yards and an agricultural and pastoral society. The cooperative milk factory was the only large industry that had been attracted there. Postwar population growth was at first mostly in the eastern (Altona) end of the shire. Werribee township's rapid growth began in the 1960s, the population more than doubling between 1961 and 1971 to over 12,000 persons. The township acquired additional recreational facilities, new churches and denominational schools, two more State primary schools and a district hospital. Its growth had been acknowledged by the construction of the Maltby By Pass (1961), taking the Melbourne to Geelong road out of the town's centre. A new suburb adjoining the Melbourne side of Werribee, Hoppers Crossing, was commenced. It grew rapidly, acquiring a drive-in shopping centre in 1981, along with pre-school facilities and State and church primary schools. Four years after the Hoppers Crossing shopping centre the Werribee Plaza, about three times as big (39,000 sq metres), was opened, but actually on the edge of Hoppers Crossing. This left scope for the strip shopping centre near the Werribee railway station to be enlarged and for a village shopping centre to be built on the other side of the railway line. The Corpus Christi seminary closed in 1973 and the Werribee Park property was sold to the State Government. The mansion and outbuildings have been carefully preserved along with the formal gardens. A zoological park, the State Rose Garden and the State Equestrian Centre have been included in its grounds. The closure of the seminary did not herald the diminution of the Catholic community. In addition to the original St Andrews Catholic primary school (1908) near the racecourse there are two more in the suburb of Werribee and one each in Hoppers Crossing and Wyndham Vale. There are also secondary colleges in Werribee (1970), Werribee South and Tarneit. There is a linear park along the Werribee River, and elsewhere watercourses drain into swampy basins which have been made into recreational wetlands. In addition to these large spaces there are ball-game courts and ovals on two other reserves. Upon decommissioning of the Animal Research Institute parts of the site were kept by the University of Melbourne and Victoria University and the much larger uncommitted land was designated the Werribee Employment Precinct. Mainstream Aquaculture, a high-tech barramundi hatchery at Werribee is the largest of its type in the world, producing more than 30 million juvenile fish every year for export. The State government announced plans for a new suburb in east Werribee in 2013, located south of the Princes Highway to Hacketts Road in the east and Wattle Avenue in the west. The 700 hectare site would accommodate 7000 new homes.